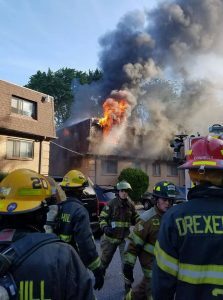 On Monday 9/6/17 RIT/Rescue 20 was dispatched to a working apartment building fire with people trapped on the 300-blk N. Sycamore Ave. in Clifton Heights Borough. First-in units arrived to find heavy fire showing from the 2nd floor with numerous people hanging out windows. 20-1 was later dispatched on the 3rd alarm for manpower. Rescue 20 and 20-1 were on location for just over 3 hours.